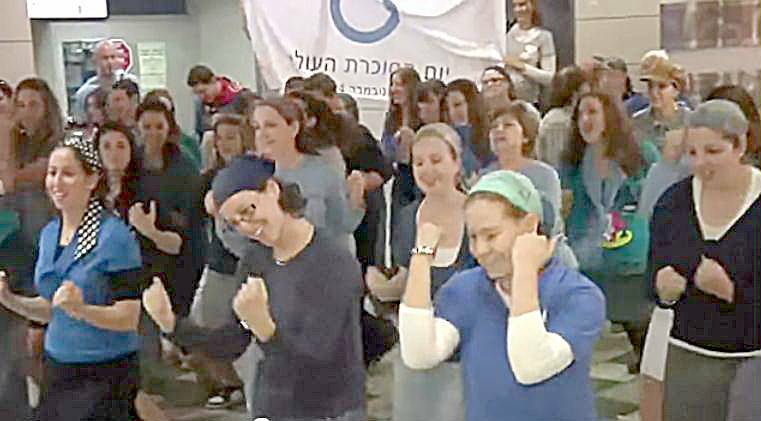 Our regular readers know that we're fans of flash mobs, especially when they take place in Israel or involve Jewish themes. In the last two years we've run videos of a Purim flash mob in Russia, a Chanukah flash mob in Jerusalem, a "flesh mob" on the beach at Rishon LeZion, an outbreak of dancing at a Haifa mall, and a spontaneous operatic performance at the Dizengoff mall in Tel Aviv. Last Sunday it was Jerusalem's turn again as its Central Bus Station was the scene of a flash mob with dozens of women and a few men falling into line to perform a line dance to Michael Jackson's hit song Beat It. What was the "it" they were trying to beat? Diabetes. The flash mob was organized in conjunction with an international effort for World Diabetes Day, which saw identical dances in cities across the globe. Some of the dancers were professionals and some not, but they all put in time rehearsing the performance before going "on stage" in the middle of the food court at the bus station. Enjoy!